Today, we remember our veterans -- those that have died for our country, or have given tremendous sacrifices to fight and protect our freedom. 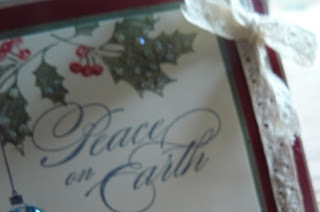 My prayer is for peace, and my card, although not specifically red, white and blue, speaks of this and looks for peace. This is actually last week's Blogger's Challenge -- a patriotic theme. Although I finished it early in the week, I didn't find time to post until today. Below, you will see some close-up photos of the card. I used Crystal Effects on the holly leaves, along with some Dazzling Diamonds glitter to resemble due on the leaves. Under all the photos is my holiday "recipe". Ink: Stampin' Up Marina Mist Classic Ink; markers: Always Artichoke, Cherry Cobbler. Paper: Stampin' Up Crumb Cake, Cherry Cobbler, Always Artichoke, Very Vanilla card stock. Accessories: Chantilly Lace crochet trim, Crystal Effects, Dazzling Diamonds glitter, Fine Supernova Stampin' Glitter in Aqua. 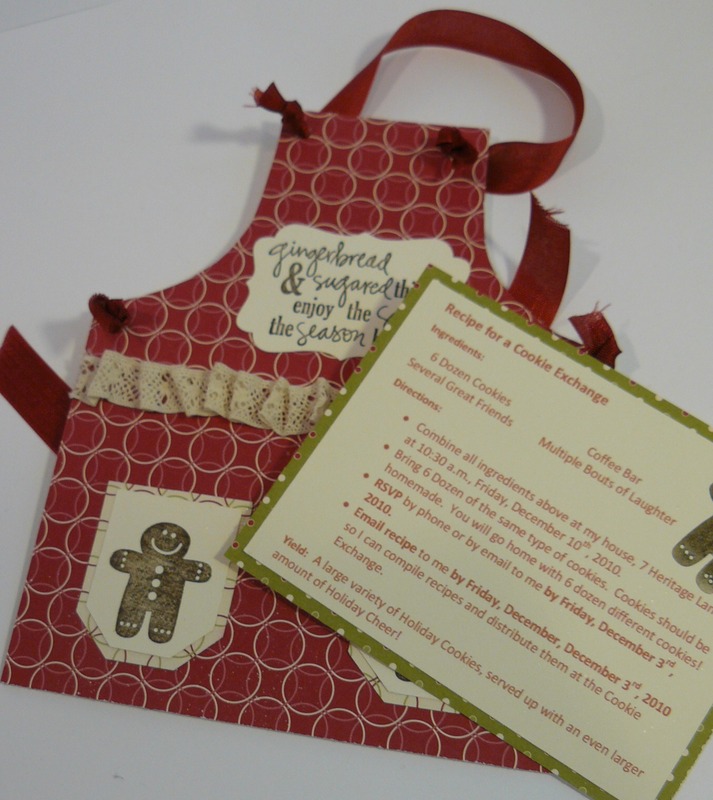 My last project that I shared on the Royal Blog Tour featuring the stamp set Sweet Season is an absolutely adorable Christmas Tree ornament! *(YILMP! see below for the "interpretation"!) This is larger than the Milk Carton die that Stampin' Up! sells, and it has a great detail that I absolutely love about it! I purchased the tutorial for this milk carton from Becky Roberts at Inking Idaho, probably two years ago, and I use it consistently. I love the size of this milk carton, and I love that it has a different bottom closure so the carton does not have to be destroyed if the top is decorated in order to get at the enclosed goodies! Becky has this tutorial for sale HERE, but I will briefly explain a few things I did to make this fabulous Christmas ornament tealight holder. First of all, after scoring the box, I punched a hole in one of the large sides (2 sides are wider than the other 2 sides) with my 1 3/8" round punch. I then assembled the box. The bottom is put together by adding a tag using the small tag punch -- the opposing side has a slot punched out of it using the horizontal tag punch (first center it, then move it slightly left and again slightly right). My roof (see the photo above) is made by measuring the width of the roof panel and adding 1": 1/2" to each side, but 1/4" of that is removed with the Scallop Edge Punch. I then scored a line at the absolute width of the roof (after I've punched the trim on each side -- this leaves about 1/4 inch overlapping each side). The length of my roof was made in a similar way -- I measured the length of the roof on one side, doubled it for the back side, and added on 1". Does this make sense? Email me or leave a comment if it's "greek" to you! You should be able to figure out the size of any roof using this "formula". I made my roof glittered and "snowcovered" by using my two-way glue stick and then sprinkling the wet glue with White Chunky Glitter. The trim on the sides and bottom of the house are made by cutting narrow strips of the Candy Lane DSP, then scoring down the middle and attaching them where I did. I punched out a red bird using Poppy Parade paper, a yellow head using my Daffodil Delight card stock, and a black head using my Basic Black card stock. I punched out a second "wing" from my red card stock as well for the "top feathers" of my bird. Then I just snipped away till it kind of resembled a cardinal. Oh yes ... I punched it with my 2 step bird punch. The leaves beside/under the bird were done by punching out Soft Suede card stock leaves. 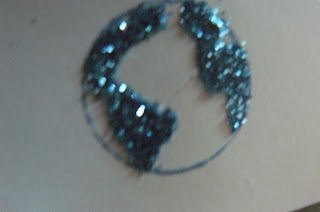 I used a glue stick to thoroughly cover the leaf tips, and then dipped them in the white Chunky Glitter. 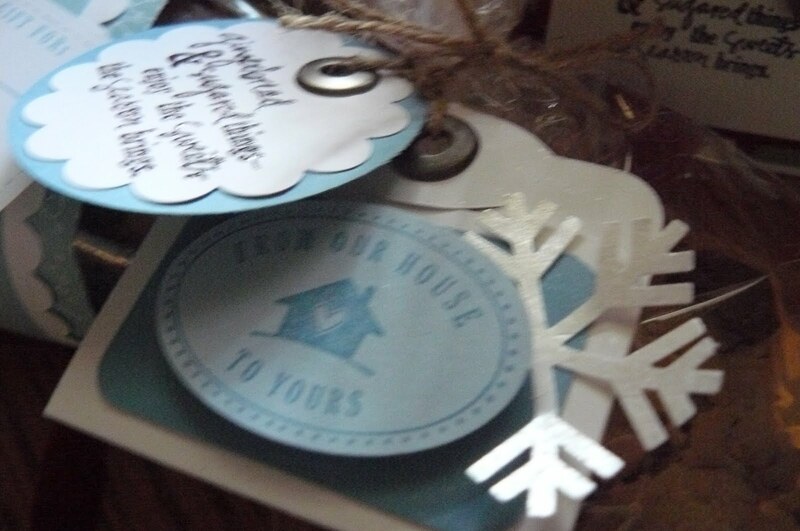 To make this project perfect for the Royal Blog Tour using Sweet Season, I popped up a stamped and embossed Poppy Parade "from our house to yours" sentiment. 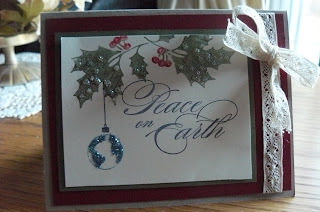 The sentiment was stamped with White craft ink, and then sprinkled with White Embossing Powder. Oops ... I'm not sure the embossing was dry when I handled it to punch it out! The inside of my birdhouse holds the battery operated tea light. Because I have the tag bottom to my ornament, I can turn the ornament on and off as I'd like. I attached the Cherry Cobbler seam binding to hang the ornament because ... well, because I just love this seam binding!! That's why!! I hope you enjoyed hearing about all of my projects as much as I enjoyed sharing them with you! Stop back again soon for some Thanksgiving cards and projects! 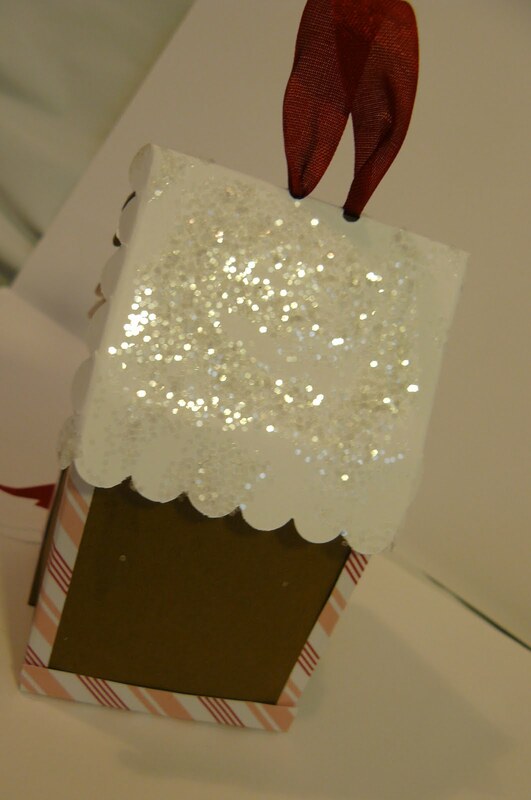 I have an adorable turkey made with the Sweet Treats cups that I can't wait to show you! This was shared with me by one of my fellow demonstrators. I'm going to add a shameful plug to join my Team of Demonstrators! One of the advantages is that everyone shares ideas with one another! This adorable apron Cookie Swap invitation is one of my favorite projects for the stamp set Sweet Season that I featured for the Royal Blog Tour. (Oh... who am I kidding ... I loved every one of my creations for the tour!!) A used a template for the apron card that I printed out from Mirkwood Designs. The invitation fits into a large Whisper White envelope. I enlarged the provided template 135% to get the size that I was looking for. 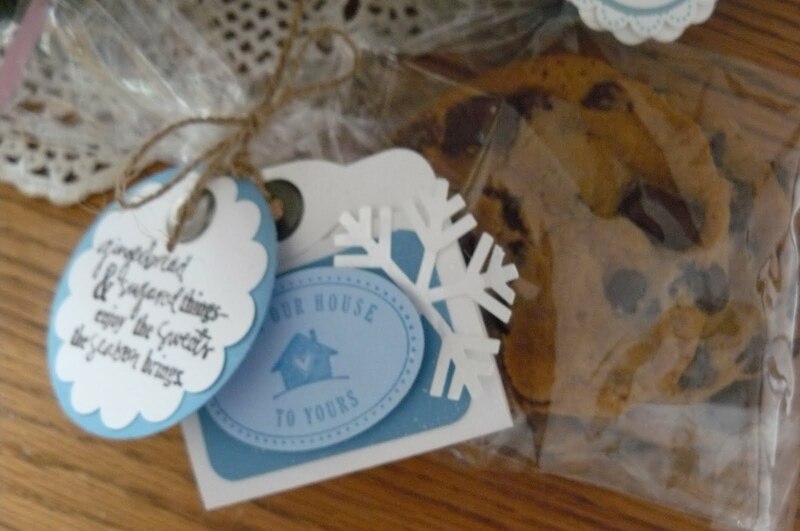 I needed it small enough to fit into an envelope, but large enough to stick the Cookie Swap details in the front pocket, with print large enough that everyone could read it and know the details! I punched apron pockets out of another pattern of the Jolly Holiday DSP using the large tag punch that I matted underneath the stamped Vanilla small tags. 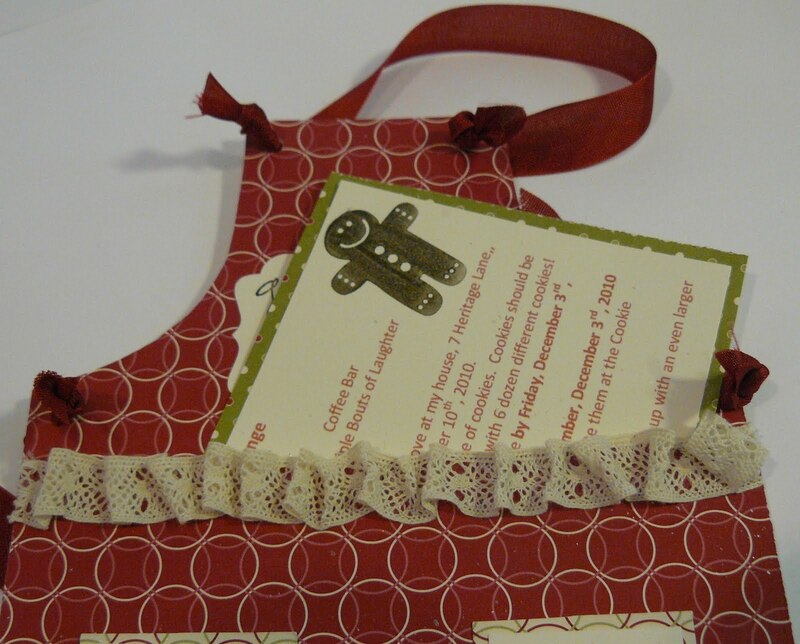 The pockets were stamped with the adorable gingerbread man from the Got Treats stamp set. (I used him again on my invitation card details!) The trim is the Chantilly crochet lace trim -- I attached a layer of Sticky Strip, then randomly bunched and attached the trim to the Sticky Strip. 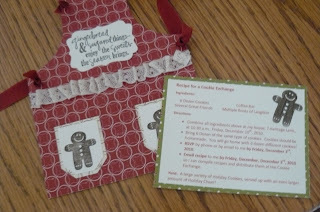 The top of my apron has the Gingerbread sentiment again -- perfect for the finishing touch! I punched it out using the new Decorative Label Punch. Again, my Cherry Cobbler seam binding (don't you love that sheen?!) made up the apron strings. I attached a magnet to the back of the invitation so nobody will forget the event! Of course, I also had to stamp by Stampin' Up! details so maybe someone will get to know me and what I do better! Well, I'm out of time again! You know what that means! 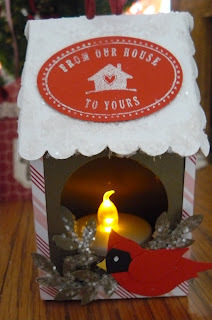 I'll be back tomorrow with the details of how I made my little Birdhouse/Candle Holder Ornament. Hi everyone! Thanks so much for visiting my castle on the tour, and for returning for all the details on all the projects I prepared for the Royal Blog Tour! As I said, the stamp set that I'd chosen to spotlight is called Sweet Season. It contains 4 stamps. They're perfect for gift-giving, which is what I'll show you again! 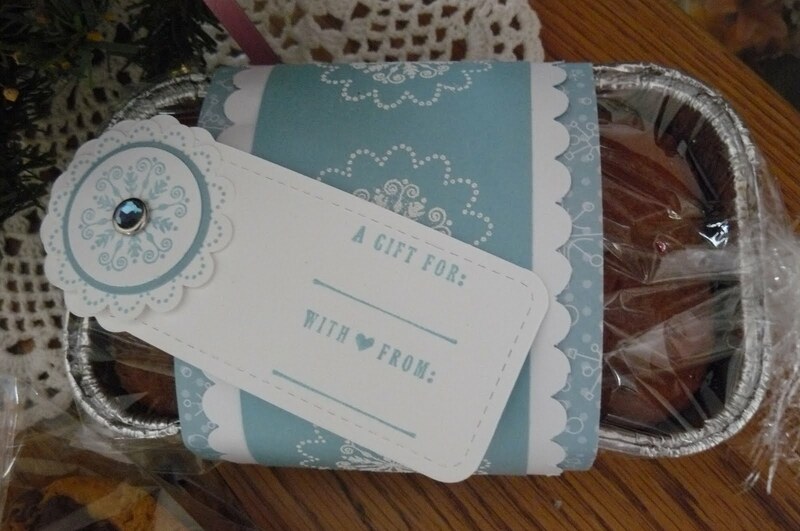 The next photos show my gift package of homemade Chocolate Chip cookies! You didn't get to see this project because I could only display 6 photos! How do you show just 6 photos with five projects?! Well, I had to eliminate it as one of the projects, but it was too good to not share with y'all! I'm thinking that this cookie package would look wonderful with an adorable Gingerbread Man cookie, or even with some colorful Christmas Sugar Cookies! I made two tags for this yummy bag! First, I made a tag using the 2nd tag from the 2 Tags Bigz die. Inside (sorry, I guess I didn't take a photo of the inside of the tag!) 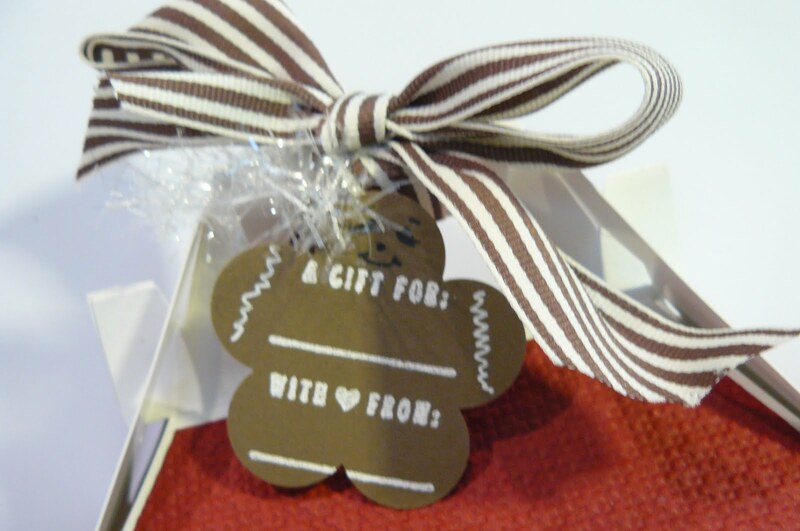 I stamped the "gift tag" sentiment, "For ____ with love from ____. " I layered a punched oval stamped with Marina Mist on a Bashful Blue scrap, then popped it up with Dimensionals on a scrap of Marina Mist card stock. A punched Whisper White Snowflake that I sprayed with some "homemade" glimmer mist paint spray gives a little shimmer to the snowflake. 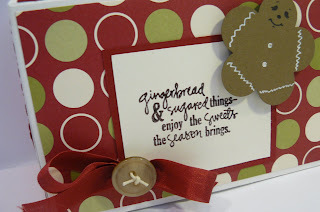 My second tag for the cookies uses the cute Gingerbread sweets sentiment -- I punched a round circle of Marina Mist card stock using my 2 1/2" round punch, then stamped my sentiment on white card stock and punched it out using the larger new round scallop punch. 2 jumbo Antique Brass eyelets enable me to thread my linen thread through and attach the tags to the cookie gift. 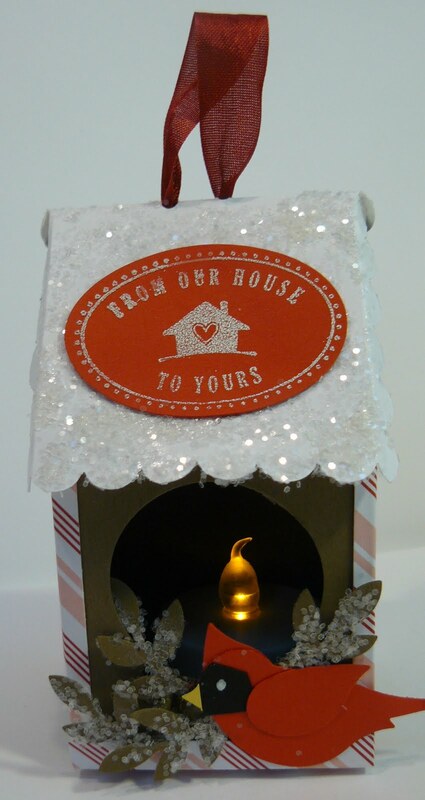 I love this small gable gift box. It is 4" x 6" x 6" high. I honestly don't remember where I purchased this box, but I sure do wish I had more! I attached some lovely patterned Jolly Holiday DSP to the large sides of the box. For the small bottom sides, I embossed 4" x 4" Cherry Cobbler card stock with the Petals-a-Plenty embossing folder. 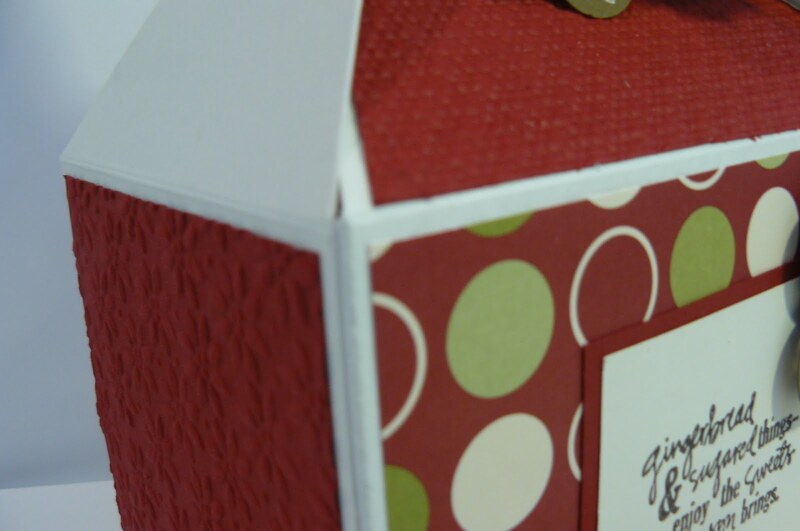 The top roof pieces are also Cherry Cobbler card stock pieces, this time embossed with the Square Lattice Folder. Don't you love the sentiment? I stamped and embossed it with Chocolate Chip craft ink on Whisper White card stock and matted it with more Cherry Cobbler card stock. 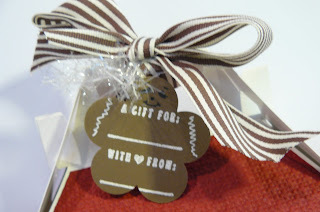 Guess how I made the little gingerbread men for my gift tag and my accent?!! As soon as I purchased the Fancy Flower Extra Large Punch, I envisioned a gingerbread man! I drew in his facial features with a black marker, and the icing "buttons" and trim are done with the Signo Gel pen. A Cherry Cobbler seam binding bow is the perfect accent in the lower corner of my box. I used some linen thread to attach my Deck the Halls Big Designer Button to the bow. To the top of the box, I tied a wide grosgrain (this is Chocolate Chip, but it would look just as lovely with the Early Espresso color!) ribbon bow. What I discovered is that this box could hold either a bunch of cookies, or even a mini holiday bread! Maybe we could fill it with stamps and ribbon for a special customer?! Hmmm.... I wonder what else I could put in there?!! Well, please come back tomorrow for the details of my Cookie Swap Invitation! Welcome to my Castle on the Royal Blog Tour! Hear ye! Hear ye! I announce to you, my fair visitors to this royal castle, that I'm so excited to show you all the projects I've been constructing for this Royal Blog Tour! The stamp set that I've chosen to spotlight is called Sweet Season. It contains 4 stamps, and I love all the images. I found that they're perfect for gift-giving, which is what I'll show you! I made 4 projects for your viewing pleasure, but I wish I had more space to share all of my ideas that I've pondered! I'd love to share all the pictures of every angle of every project, but in the interest of limited time for this tour (I don't want to keep my "subjects" from visiting every other castle in this fair land! ), you'll have to come back for the finer details! 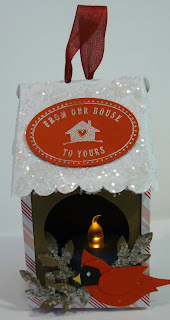 My first project is a Small Gable Box that I purchased elsewhere -- I decorated the sides with Jolly Holiday DSP and card stock. 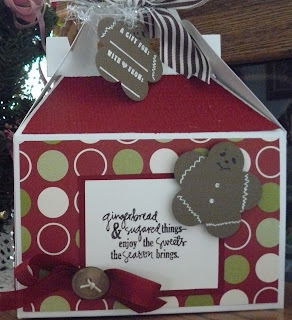 My little gingerbread tag at the top of the box uses the gift tag that is part of this set. I also used the "gingerbread" sentiment on the front of the box. (Do you recognize the gingerbread "men"? Come back after the tour for a complete and thorough explanation and for more closeup photos of the box as well! 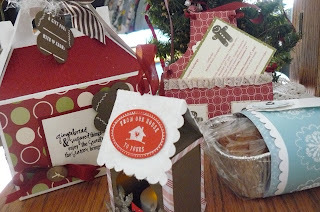 My next project is an invitation to a Cookie Swap that I will be hosting in December. I used a template that I found online (again, I'll provide the link after the tour so make sure to tag this blog to come back to!) that I enlarged and decorated. I again used the Jolly Holiday DSP, the Chantilly Lace Crochet trim, and the little gingerbread man from the Got Treats stamp set. 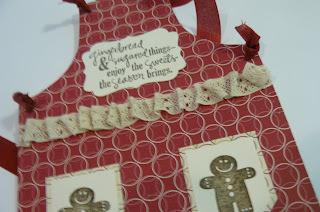 The apron top again used the "gingerbread" sentiment from this lovely set! My third project is a food gift that I made "presentable" using images and tags from this stamp set. (I have to laugh as I type this, because I don't think anyone would turn it down just because I forgot to make a gorgeous tag for it! LOL!!) 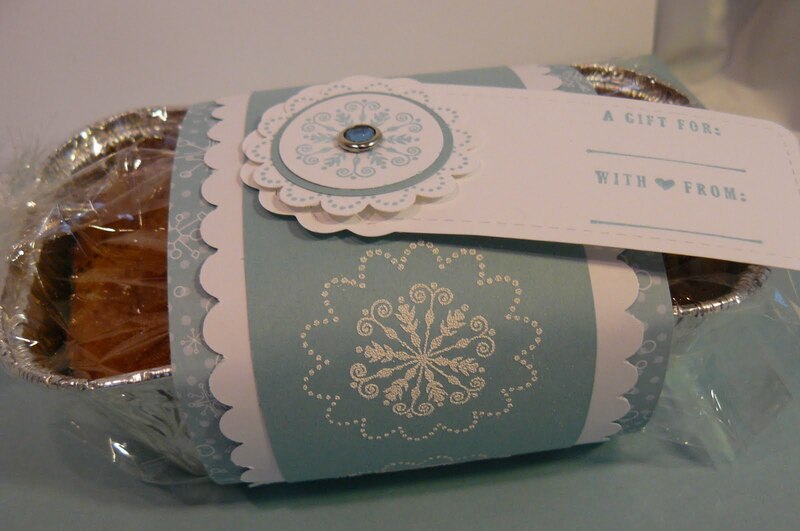 I embossed the bread wrap using the snowflake image, and I repeated the snowflake image on my tag that I cut out with my Big Shot and the Two Tags Bigz die. I'll show closeups in a followup post after the tour! Feast your eyes on my last project: a small Milk Carton Birdhouse Tea Light Holder Ornament!(Phew!! Say that 3x fast!! LOL!) 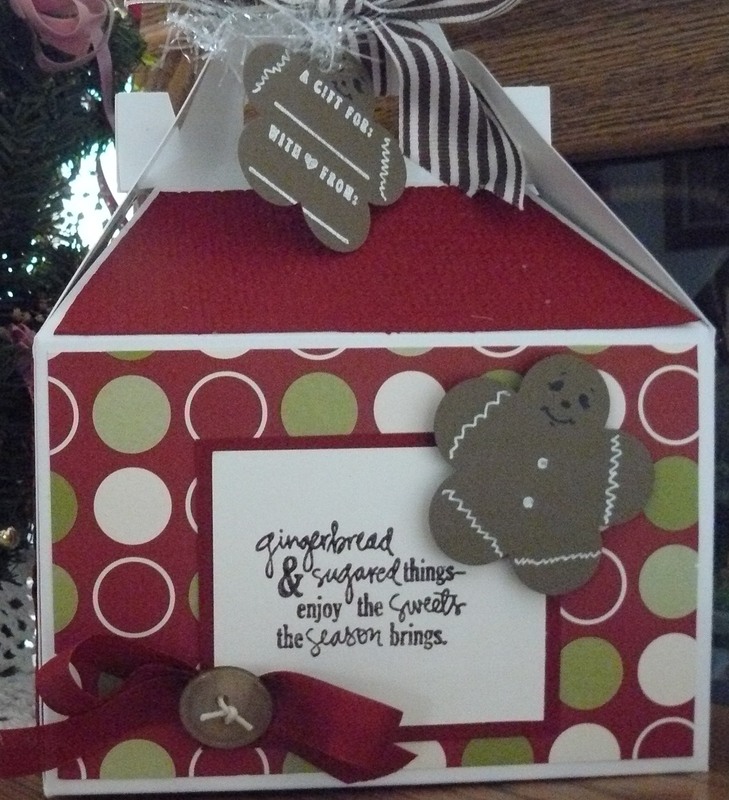 The milk carton uses a different template than the Milk Carton die from Stampin' Up! -- it is slightly larger and has a delightful twist that I'll show you later! So ... you guessed it ... I'll fully explain this in a followup post after the tour as well -- just trust me, it's adorable and probably my favorite project! Please, please come back after the tour so I can bestow the blessings of details and close-up photos without limit! In the meantime, thank you for visiting my fair land! Merry Christmas! It's almost time! In days, you're invited to grace the "castles" of some of the finest blogs -- all participating in the Royal Blog Tour! I can't wait! There are 6 Royal Paths. You can visit the website HERE for further details! I'll be giving away blog candy during the tour too, so make sure you leave me a comment!